Any time of the year is a good time to visit Baguio City. It really all depends on how exciting or relaxing you want your vacation to be! Our year-round cool climate and lovely natural environment is one major attraction for those wishing to experience an entirely different Philippines. of March, April and May, especially on the Holy Week. But what some may not realize is that Baguio hotels are full (and booked months in advance, too) during the Christmas season. Because the month of December is the most popular time for Filipino families, with or without balikbayan relatives, to get together for reunions, weddings and other celebrations. Summer Capital of the Philippines! Festive February. A deluge of tourists come up for the Baguio Flower Festival (Panagbenga) in February -- the same month the Philippine Military Academy Alumni Homecoming is held. Food Festivals. 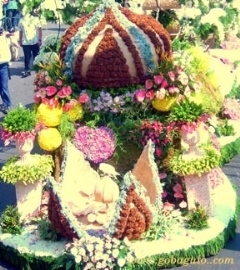 There are two huge festivals in the culinary arts -- those of the Hotel Restaurant Association of Baguio (HRAB) that caters to members of the hospitality industry and its students and the Baguio Association of Hotels and Inns (BAHAI) Baguio Tossed Salad Festival which attracts tourists and locals alike. Convention City. A popular venue for conventions, our meeting halls are filled with delegates throughout the year for corporate, religious and industrial conferences. Favorite venues for government and religious groups would be Teacher's Camp, Baguio Convention Center and the Saint Louis University Gym, among others. For corporations and other organizations, The CAP-John Hay Convention Center and the Baguio Country Club Multi-Purpose Hall are preferred. University Town. Considering itself the educational center of Northern Luzon, Baguio is converted into a 'university town' during the Philippine school year from June to March, and Nursing Board Exam Review Center (believe me when I say that thousands upon thousands of nursing graduates from the Ilocos, Central Luzon, Southern Tagalog and Metro Manila regions come up to review and take the exams here) April to early June and again from October to early December. Recently 'crash courses' in the English language for Koreans on summer vacation (late July to September) are held in the many English Academies and small inns. Honeymoon Haven. The 'quiet months of January, June, July and August are the best times to go on honeymoon. January is 'perfect weather month' with the lowest temperatures, clear skies and less tourists, while the rainy months are perfect for curling up before a fire and just being in love. 'Little America' Baguio was a favorite honeymoon destination for those Filipinos who could not take the time off to go abroad, because one is transported to another time and place while in here. A graceful blend of colonial America and rich in indigenous culture, there isn't a place like this anywhere else in the world! The way to really enjoy Baguio is to select lodging accommodations that provide you with both privacy and easy access to tourist spots or business centers, regardless of the season, depending on whether your mood is festive or contemplative. Whether you come during the summer break or the schoolyear, vehicular traffic is bound to be heavy in the Central Business District (see maps) when visitors replace transient students and vice versa. The only time Baguio is really quiet is during the November 1 weekend when most current residents go to their hometowns and provinces on All Souls and All Saints Day. And during the Panagbenga and Holy Week, please be prepared to do a lot of walking, too! This page used to be really long and contained various articles that pertain to the best times to visit the City of Pines. I decided it would be better to update abd expands them and give them their own pages for easier reading. For those visitors who prefer a relaxing vacation away from hordes of tourists and excursionists, here's the lowdown on when the Summer Capital of the Philippines is a little less busy. Includes legal and special holidays in the Philippines and whether or not Baguio stores are open on those days.